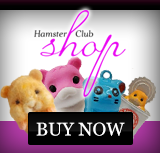 Hamster Club :: Why do some mother hamsters eat / kill their pups? Why do some mother hamsters eat / kill their pups? The joy of viewing hamster babies, but wait a moment....... you saw the mother hamster eat / kill her own pups? 1. Baby hamsters must never be handled before the age of 3 weeks, thus if you handle the baby hamsters before 3 weeks of age and without taking any precautions, there is a very high possibility that the mother hamster will kill the pups. 2. For the first 3 weeks you must not clean the hamster's cage. The mother hamster needs to stay with the babies without any interruptions. Yes the cage will smell a bit, but if you are patient and understand that by this all the baby hamsters will live then it is very worth it! If it is really necessary to clean some areas of the hamster's cage like the potty area, then you may use a non scented wet wipe. 3. The hamster's cage has to be housed in a quiet room, no noises please or else the mother hamster may kill her own pups! 4. No adult male hamsters have to be allowed in the same cage. Remember the mother hamster needs to take care of her babies alone. You may hear cases where the father dwarf hamster also takes care of the pups but this is not the safest way for the mother hamsters since she would get pregnant again which would not be healthy for her body. 5. Apart from the hamster food mix, provide the mother hamster added protein like a shallow bowl with bread soaked in milk (3 times daily), cooked egg may also be given. 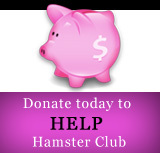 Make sure that the hamsters have fresh water available at all times. 6. Only rarely does a mother hamster kill her own pups. This usually happens when the babies are too weak or if she feels stressed or inexperienced. 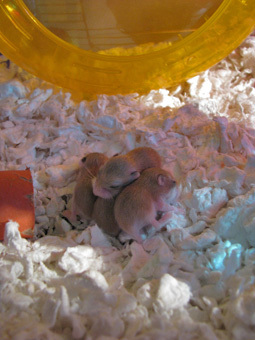 The babies at 4 weeks of age may be eventually separated from the mother hamster. Remember that Syrian hamsters are solitary while in the case of dwarf hamsters, you can keep the females with the mother but on the other hand, never introduce the male babies to the father.